On the surface, Annihilation is another stand alone Star Wars action novel like Scourge or Mercy Kill, this time set in the Old Republic. The central character is Theron Shan, the non-Force-sensitive secret son of the head of the Jedi Council, Satele Shan, a descendant of Revan. Annihilation’s prologue begins with Satele Shan making the difficult decision to give up her son to be raised by her former mentor, Master Zho. I met Satele’s choice with sympathy, although I wonder if she had been a male character if she would have made the same decision. Later, Theron’s father has no problem acknowledging his son, and Theron wonders that if the truth about Satele giving him up would make others’ perceptions of her better or worse. It’s an interesting question, and relevant to the way women leaders are perceived and treated in real life. Chapter One begins with an action scene reminiscent of James Bond. Like any good Bond movie, it opens in an exotic setting – Nar Shaddaa, an iconic locale in SWTOR. One of Karpyshyn’s talents is the ability to bring scenes to life with details: colors, lights, noises, and history, which rounded out my appreciation of both Annihilation and SWTOR. Theron himself is like Bond – he lacks superpowers, but he’s smart, inventive, and a loose cannon loaded with cool lines and even cooler devices. Theron whistles Mantellian tunes and swears in Old High Gamoresse. He’s mastered swoop bikes, infiltrated the Sith army, and stops slave trafficking. Single handedly. He’s fought and beaten powerful Sith. He uses Jedi techniques he learned from Master Zho, but he’s cynical about the Jedi. From the “pow” at the beginning, the action doesn’t stop. Even after being grounded to a desk job, Theron gets embroiled in a daring plan to destroy the Empire’s most powerful weapon, a warship called the Ascendant Spear. Karpyshyn is known for his Sith and for well-written action. Despite the non-Force-using hero Annihilation has a fair dose of Sith, including political infighting, manipulations of the Dark Council, and my favorite – great lightsaber duels. The vivid descriptions of Jedi lightsaber forms, including Soresu, Niman, and Djem So, are another example of Karpyshyn’s ability to bring depth into this story with tiny details from the game. The book also uses clever little nods to the movies that made me smile. One of the characters faces a Rodian at a cantina with blaster hidden under the table. The lines “I’ve got a bad feeling about this, kid” and an awkward, “I believe I am your father” also make appearances. Annihilation’s strength isn’t solely the tight action, but also a strong cast of characters. The main characters – Theron, Satele Shan, Jace Malcolm, Master Gnost-Dural, and Darth Karrid – are compelling. Again, details make a difference. Smaller roles are nicely fleshed out – the Imperial Minister of Logistics, Davidge, gets a rude awakening from his belief he is a nameless “cog in the machine” and you can practically see him popping antacid tablets as he performs his duties. Another Imperial officer throws back “White Novas” at a cantina. Marcus Trant, Theron’s constantly exasperated boss, has an amusing flirtation with Jace Malcolm’s receptionist, Ms. Moneypenny style. One of my favorite characters is Teff’ith, a yellow-skinned Twi’lek. She and Theron share a sibling-type bond. Teff’ith speaks annoyingly bizarre Basic, referring to herself in the royal “we,” but she adds levity with her irreverent humor and flip one-liners. She’s tough, too – at one point pulling a knife out of her shoulder while she blasts out of a hanger bay to get to Coruscant to stop an impending attack on the Republic. The characters all have close familial relationships; even Darth Karrid is the former padawan of Master Gnost-Dural. The characters’ connections with each other add depth to the storyline and a few humorous moments that are typical “my crazy family” and relatable in being eye-rolling worthy. One of my favorite scenes is when Theron feels his dad is out of line, so he tattles to mommy – who, of course, comes down hard on daddy. I love it when mommy is instrumental in saving the galaxy. 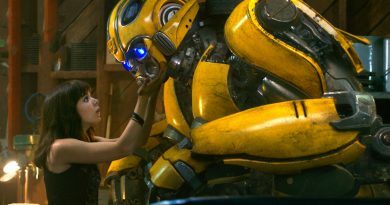 Annihilation had a few weaknesses, as well. I would have liked to know more about Teff’ith. The backstory of Theron’s relationship with Teff’ith and Master Zho could have been developed more gratifyingly. I don’t think Satele’s secret pregnancy required giving birth in an isolated cave. A few other scenes were too convenient to be wholly plausible. And the intentionally funny ending, while making me laugh out loud, was just a little too hokey for me. 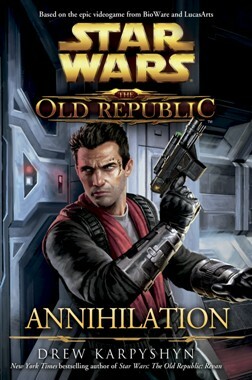 Annihilation is the book I wish Revan had been. I’ve read all of Drew Karpyshyn’s Star Wars novels and this is one, hands down, is the best. Unlike the Darth Bane novels and Revan, which dragged at times, I had a hard time putting my iPad down with Annihilation. The book has no wasted words and no dull moments. Though it’s an action novel, the heart of Annihilation is its characters. Annihilation is about relationships – the ones we want, the ones we have, the ones we can’t have, and the ones we keep no matter what. This novel deserves a hot fudge brownie sundae with ice cream, whipped cream and oozy warm chocolate sauce on top. Because it’s about family, add extra nuts.